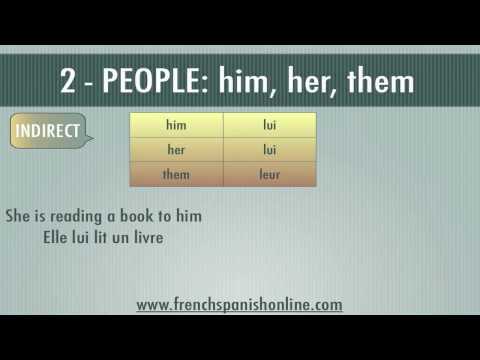 These are called subject pronouns (left) and object pronouns (right). Je me demande si c'est possible. I ask myself if it's possible. Note that they always come before the verb. And when followed by a vowel or mute "h", me and te become m' and t' . Grammar note: Remember verbs always have a subject (je/tu etc.) but only some have objects. Use object pronouns to replace nouns that are the object of the verb. Tip: If the words "object pronoun" strike horror and panic into your heart, take a look at the cartoon video in the examples which explains them. They're actually pretty easy to figure out. Why is the sentence structure changing? ( Why is the object pronoun placed before the noun.....as in Subject -Object- Verb? 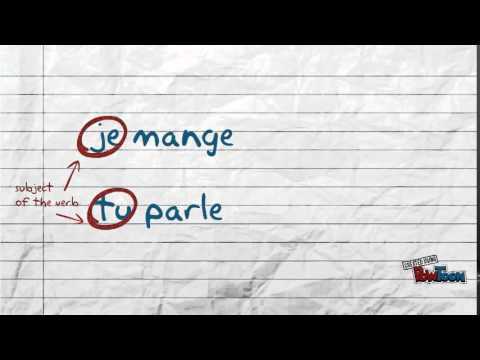 Which type of sentence structure does French use? Hm. I can't think of a reason except for "that's just how it is". Word order is usually very specific in French. but towards the ending of the video, everything got even more confusing. Je décris les gens et je ________ parfaitement. I describe people and I describe you perfectly. I wrote the second one but was marked as incorrect. Je décris les gens et je vous décris parfaitement. Please give us an example that includes both direct and indirect object pronouns. Such as I gave it to him. Hi, how do we usually know what is the L' referring here normally? Only context would tell. No way to tell from this sentence alone. Hi I refer to the sentence showed as example in the above video. Then you would need to have seen the video to be able to infer whether it refers to a man or a woman. To know the difference is purely contextual and nothing to do with French grammar. -- Chris.